For 5+ years now, my husband and I have blocked a day near the end of the year as our “Annual Planning Day.” Not only do we look forward to the tradition of spending an entire day together (kid-free daylight hours one-on-one in a coffee shop! – unheard of! ), but the event has proven to be an invaluable chaos-reduction tool. I’ve written about this topic before, but given that our annual meeting has evolved, it’s time to do a re-fresh. You and your partner carve out one or two days per year. It doesn’t matter when you do this, though one day at year-end and another mid-summer is nice. In advance of your planning day (or mid-year check-in), you come up with an agenda of topics you want to be sure you cover and questions you want to be sure you ask. You send the kids elsewhere (school, daycare, camp, family, babysitter), and you park yourselves somewhere with WiFi. My husband and I enjoy heading to Panera or a coffee shop, to get our heads out of our usual routine. You bring your agenda, a calendar, and your laptops. You order hot cocoa, gaze into one another’s eyes…and get down to the business of setting a vision for your year and mapping out some logistics. One mistake you made and the lesson you learned. Marking all daycare/school closure dates and figuring out who will stay home, what backup care we will need, camps we’ll need to schedule, etc. Choosing kid birthday party dates, and then communicating those to the family. Scheduling a few date nights, and texting our babysitters to check out their availability. New this year, blocking a weekend day on a quarterly basis to engage in a volunteer activity as a family. Size Up Travel Holistically: After having a year or two of unmanageable travel, we realized we needed to set a limit on how many trips we took per year. We now have a better sense of how much is too much and how much is just right, and we are intentional about staying within our own boundaries. Think about family visits. If you went on five long car trips to see family last year, and that felt like too much, make a commitment to going fewer times this year. Pick the dates, and communicate with family about them so there aren’t any surprises. Dream about a vacation! And then, of course, start planning. Brainstorm together, think big, think realistically, work out budgets, and get excited. Money, Money, Money: Yes, I always sing a bit of ABBA in my head at this point in the meeting. It’s time to open those bank account and credit card apps, see what came in and went out this year, and set goals for the coming year. Start with savings goals and a rainy day fund. Have you created a separate savings account for each goal? We use CapitalOne360 and have accounts called things like “kid birthday parties” and “holiday money,” to which we contribute every pay period. Think about taxes. Did you pay enough as the year went on, so you don’t owe a big chunk at the end of the year? If not, can you make a change for this coming year? Will maternity leave or other time off affect what you owe? Schedule a separate tax-prep day with your partner sometime before April. Talk through those longer-term goals, like kids’ college funds (get on top of opening and contributing to a 529 account) and your own retirement. How much are you putting aside? Are you on target? Think through your values and decide if there are nonprofit or advocacy organizations you’d like to contribute to. Consider recurring donations to automate the process of giving. Push the “Reset” Button on Health and Exercise: This is one of those areas where it’s never too late to start again. Wherever we find ourselves in December – whether with healthy eating, weight targets, or exercise – January offers a fresh page. Find accountability partners. Can you and your significant other become one another’s daily or weekly check-in person on where you stand with food or exercise? As working parents, life – and the most important and beautiful things about it – can get away from us so quickly. Taking the time to reflect on last year and plan out the coming year frees us up to be more mindful and present during the year ahead. And that’s the whole point, isn’t it? 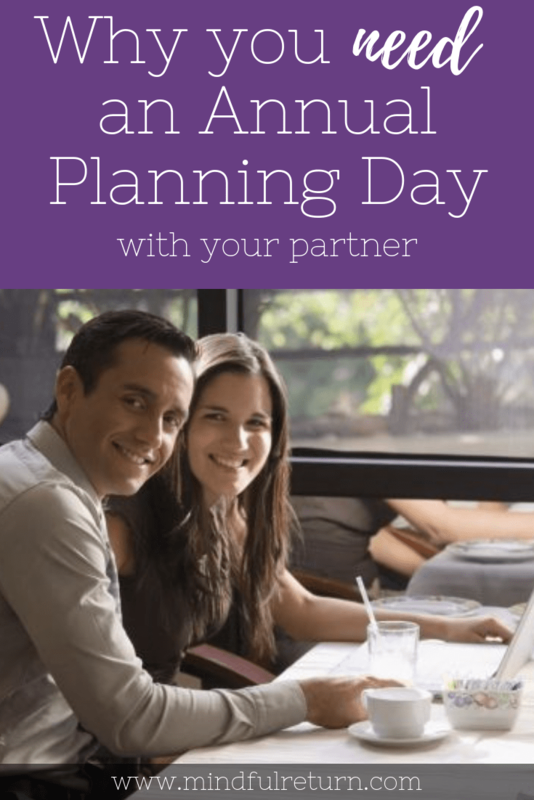 Do you have your own version of an annual planning day? Going to give this a try? Share in comments what questions you have and how it went for you! Heading back to work after maternity leave soon? Want advice and a supportive community of new working mamas from all over? Join the next session of Mindful Return. Thanks so much for sharing, Alex – and good luck with your own planning session! Love this idea! We’ll be doing something similar this week to figure out holidays and vacations for the upcoming year. In terms of my son’s school breaks, I try to get that in the calendar once his school calendar comes out so we have his school year figured out by the end of the summer. Thanks, Nicole! Hope your planning session goes well!